An orphan from a young age, Hawkeye has a troubled past. Born as Clint Barton and with nowhere else to run, he joined the circus and was trained in the art of archery, adopting Hawkeye as his stage name. His performances showcased his outstanding talents, and he soon became known as the Worlds Greatest Marksman. Here at Superheroes Direct, we have a variety of Hawkeye collectibles and apparel. 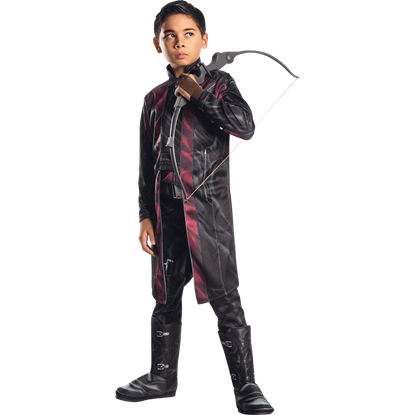 For those looking to don the suit of this elite archer, we offer costumes for both children and adults, featuring Hawkeyes look from the Marvel Cinematic Universe Age of Ultron film. We also offer t-shirts depicting Hawkeyes superhero symbol as well as apparel showcasing his comic book appearances. Collectibles, such as paperweights, POP figures, and home decor will also delight any diehard fan of this master marksman. Archers often have sets of skills that require special equipment, and the Avenger Hawkeye is no exception. Wear the Adult Avengers 2 Hawkeye Archers Glove for added detail and authenticity when dressing up as this expert marksman. Get the look of Marvels famed marksman as he appears in Captain America Civil War. 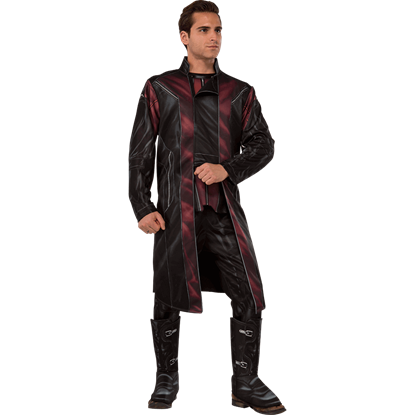 The Adult Civil War Deluxe Hawkeye Costume features a tactical-looking jumpsuit with matching bracers and boot tops, all with fantastic printed detail. Super skilled in archery, Clint Barton is a Marvel Avenger known as Hawkeye. 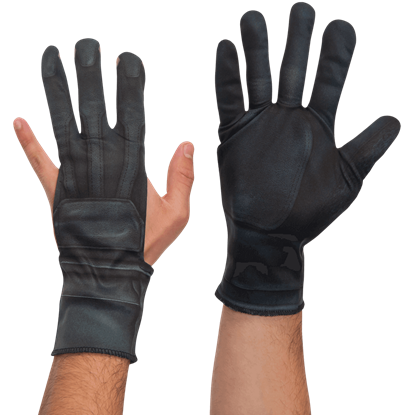 For anyone looking to dress as this master marksman, no outfit is truly ready without hand accessories like the Adult Civil War Hawkeye Gloves. The Avengers return in the sequel film, Age of Ultron, to defeat a technological enemy bent on the destruction of the human race. 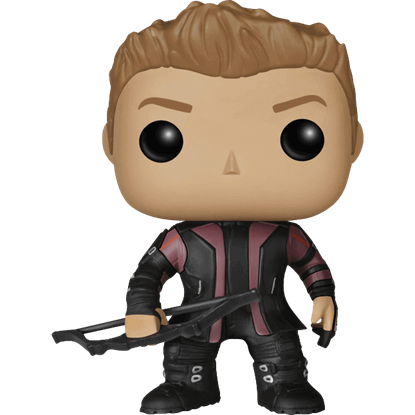 The Avengers 2 Hawkeye POP Figure depicts the incredibly talented archer and marksman in his suit. An incredibly talented archer, Clint Barton returns to the Avengers in the cinematic sequel, Age of Ultron. 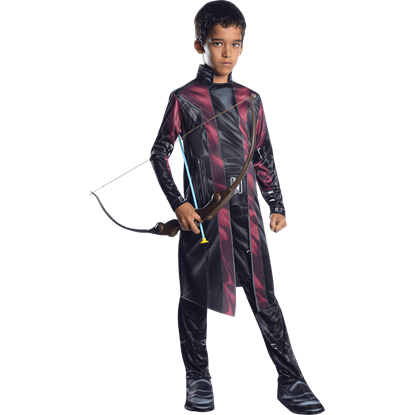 The Boys Age of Ultron Deluxe Hawkeye Costume lets your child to dress up like the S.H.I.E.L.D. agent-turned-superhero. An incredibly talented archer, Clint Barton returns to the Avengers once more in the cinematic sequel, Age of Ultron. 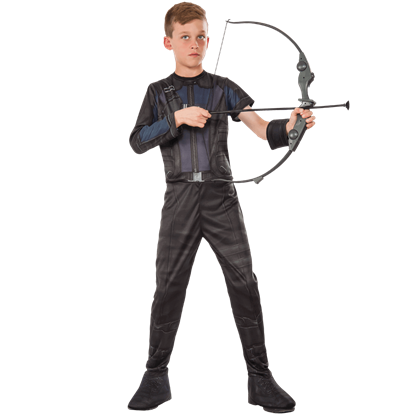 The Boys Age of Ultron Hawkeye Costume allows your child to dress up like the S.H.I.E.L.D. agent-turned-superhero. 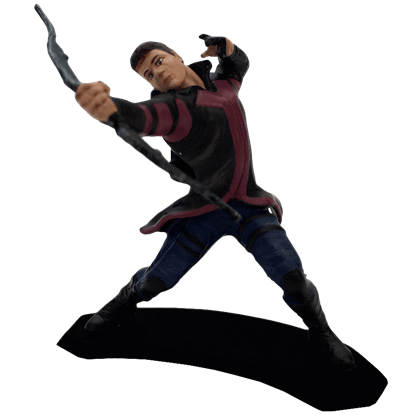 The Hawkeye Age of Ultron Metal Miniature depicts Clint Barton, code name Hawkeye, with his bow in hand and arm pulled back as if he had just fired a deadly arrow at his target. 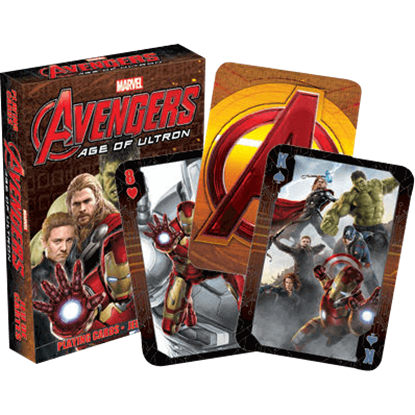 This Avengers collectible is limited edition and hand-painted in high detail. 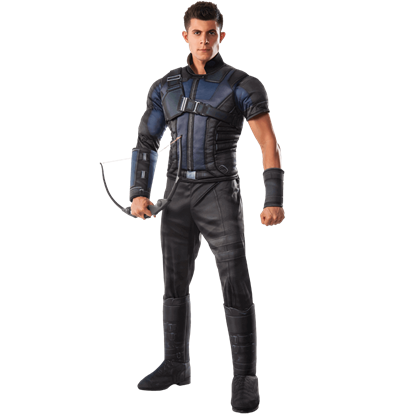 If your child loves the Avengers ace archery specialist, then the Kids Civil War Hawkeye Bow and Arrow Set is a must-have accessory for their next costume. This set includes a bow and arrow based off those used by this superhero. Those skilled in firing a bow often require specialized hand protection, and Clint Barton is no exception. 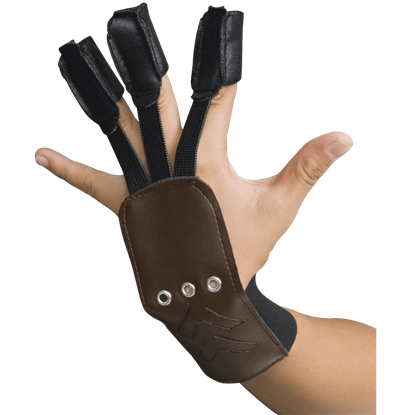 The Kids Civil War Hawkeye Gloves is a pair of gloves where one hand features strategic pinky and thumb cut-outs. Clint Barton ran away from an orphanage and joined a traveling carnival, where he learned to be a master archer and took the name Hawkeye. 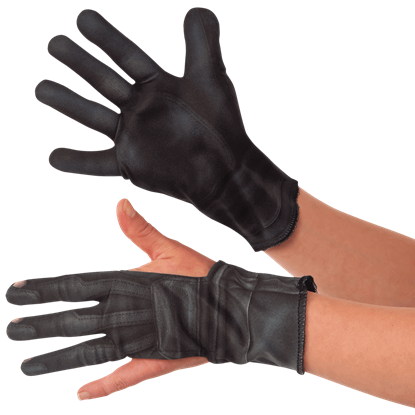 This Kids Hawkeye Costume Archer Glove adds an authentic touch to your childs Avenger costume.